Every year, the Arab region is introduced to a fresh crop of Egyptian talent on the big screen or on TV, especially during the Ramadan season. eniGma’s Farida El Sayed sat down with five young actors who have mesmerised us with their talent, style, and charm. It’s our guess that these fresh stars will have you beckoning them for more screen time. Despite being the grandchild of the legendary Egyptian movie star, Kamal El Shenawy, for a long time Omar Shenawy did not consider following his famous grandfather’s footsteps. He studied architecture at Cairo University and actually pursued that profession for 12 years. “There were a lot of actors in our family, including my grandfather Kamal El Shenawy, Zaki Rostom and Magda El Khatib, but I wasn’t interested in acting,” he explains. He candidly admits that he was put off by how his grandfather couldn’t go out easily. “He had to always look his best when going out because he had a certain image to uphold,” he recalls. Shenawy didn’t feel comfortable with the strains on his grandfather’s life. However, destiny had other plans for him. After attending acting workshops with his best friend, he became seriously engrossed in the prospect of becoming an actor himself. Shenawy’s first TV show was Al Ab El Rohy (The Godfather) in which he played the part of a “greedy person, who would hurt a person he loves just to get money. A character very different from my own, so it was challenging,” he explains. His next role was also on TV, in the series, Kalabsh (Handcuffs). 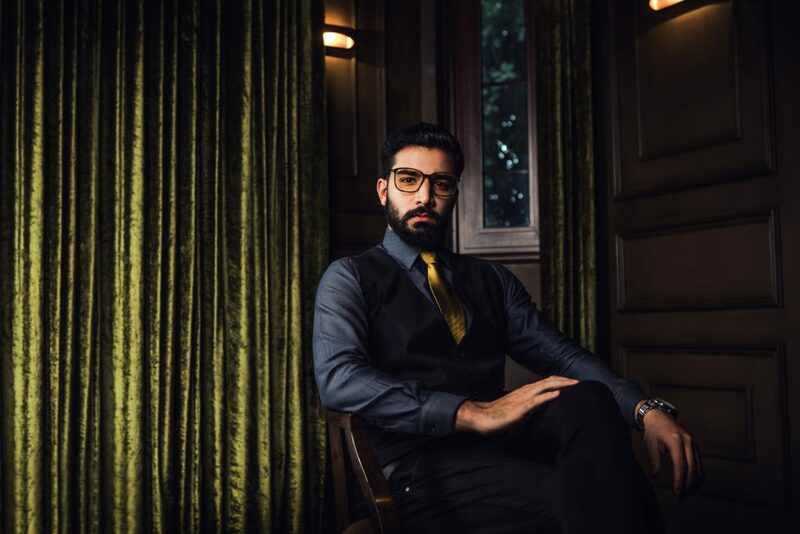 He says, “I felt really connected to the character this time because it is close to who I am as a person.” Although Al Ab El Rohy was his first on screen appaearance, Shenawy considers Kalabsh to be his true breakout role. “After Kalabsh, people would notice me on the street and would take pictures with me. I noticed a big difference. It’s nice to see the effect of your work straight away on the street,” he notes, with a smile. When Shenawy isn’t acting, you can catch him kite surfing in Ras Sudr, “I’ve been doing it for three years, which is actually not a long time. But I go almost every weekend. It’s a very addictive sport in terms of the adrenaline rush, something that never ends.” Kite surfing is also how he got to meet his beautiful wife, Hend. This is his second marriage, and he didn’t hesitate to give advice on the subject. “Honestly, marriage differs from one person to the other. It’s all about if it’s a fit or not,” he explains. Currently Shenawy is working on the second installment of the highly acclaimed TV series, Al Ab El Rohy. What three words best describe you as an actor? My shyness. I was a very shy person, but I started changing as a result of acting. My biggest regret is not acting sooner. In acting, Marlon Brando, Tom Hardy and Daniel Day Lewis. In Egypt Ahmed Zaki or Mahmoud Abdelaziz. Abroad, probably Samuel L. Jackson. Being content with what you have regardless of whatever it is. If your life was a film what would the title be? 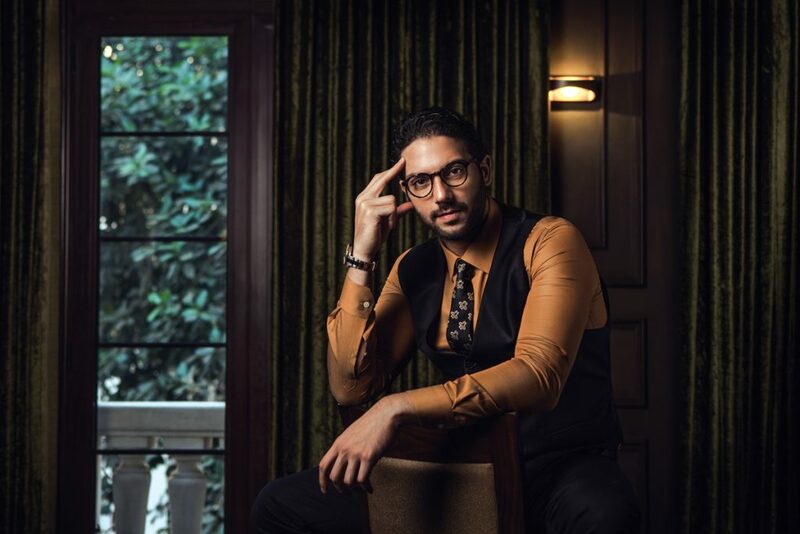 At only 31, Aly Kassem has already starred in three very successful TV shows, from Fo’ Mostawa El Shobohat (Above Suspicion) to La Totfe’a El Shams (Don’t Turn off the Sun), and most recently Tayea. This math-genius-turned-actor has been very lucky in the projects he’s chosen, and his talent speaks for itself. “I wasn’t really exposed to the arts when I was young,” Kassem recalls. “My dad always loved movies, but that is the only artistic influence I can remember as a child. I always had a math-oriented mentality!” he explains. This led him to pursue a degree in electronics and telecom engineering at Cairo University. However, he discovered acting during his last year of university, when he joined an Ahmed Kamal workshop just to try something different. “I loved it, but that was it. It became my hobby,” he recalls. Despite enjoying the acting workshop, he always maintained a proper distance between himself and the acting field. “I was afraid of ruining my hobby, and I was afraid to actually try and fail,” he reveals. “This is the first year when, if I’m asked what I do, I answer with, ‘I am an actor’,” he admits. La Totfe’a El Shams was a big challenge for Kassem, as he played a homosexual character. “Accepting this role made me realise the risks I was willing to endure to become an actor.” Although he was subjected to quite a bit of bullying because of this part, he strongly believes that, “every single character who lives in real life deserves to have a place on the screen.” He was able to get through the backlash with the support of his fiancée, Nora, and his close friends. This year he played Dahy, a character from Upper Egypt in Tayea. Kassem is excited to be currently working on Ras El Sana (New Year’s Eve), with Eyad Nassar, Ahmed Malek, Sherine Reda, Injy El Mokkaddem, and Basma, a movie written and produced by Mohamed Hefzy. “All I want, is to be a better actor and I think any actor should live and die with this passion” he says. Well, the movie that affected me the most at a specific time in my life is Into the Wild. Blues, like the B.B. King. Michael Fassbender and Marion Cotillard. Being able to be genuinely grateful for the things we have or the moments we are experiencing. I’m connected to the feeling of gratitude, most of the time I can say I am happy. What do you admire most in a woman? I don’t believe in this question because we usually end up with people we can’t describe. But what I admire most in a human being, whether it is a man or woman, would probably be modest talent. From the minute Amr Wahba stepped on set, everyone could not contain their laughs. If you haven’t caught him on Saturday Night Live – Bil Araby, you can now see the 33 year-old comedian show off his acting chops on his latest blockbuster Al Kwayeseen (The Good People). Wahba was born in Paris, but his father brought him and his siblings back to Egypt to instill them with traditional values. Wahba was placed in Al Azhar schools from his elementary years up until university. He jokingy recalls, “From Paris to Al Azhar, that was one big jump!” Upon graduation, in 2009, he got a job at a telecommunications company, and on the side, he would make humorous videos and write witty and sarcastic posts on Facebook. “I would write for the Plateau or Abu Hafiza, but my dream was that I wanted to be an actor,” he recalls. The restlessness. I can’t enjoy the moment. I am constantly worrying if my next project will live up to my previous one. What has been your favourite film? Castaway. The film stars Tom Hanks from beginning to end, which is an impressive feat for an actor. I really admire Ahmed Helmy’s trajectory in the field. (Jokingly) I like fame and money. If your life was a film what would it be called? Edhak W El Surra Tetla’a Helwa (Laugh and the Picture Will Turn Out Nice). Starting his career at the tender age of 13, Ahmed Gamal has always had an affinity for acting. 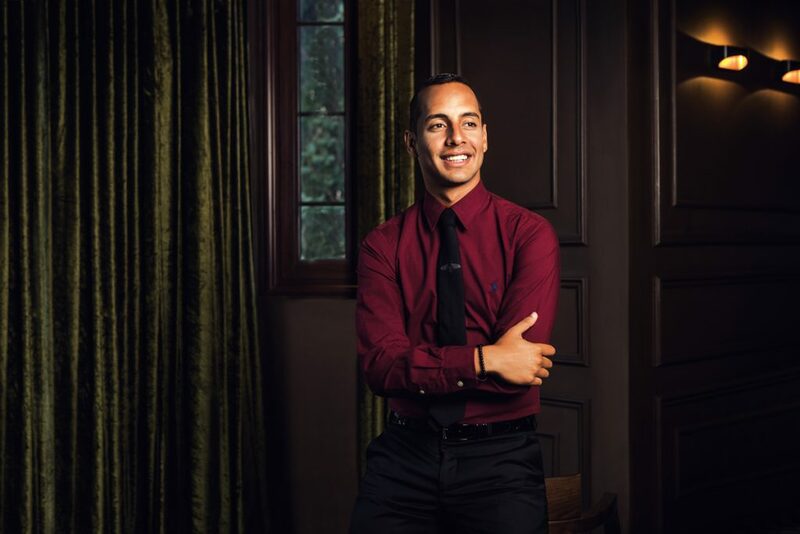 Although his grandparents are Farid Shawky and Hoda Sultan, he did not use the easy way to get where he is today. 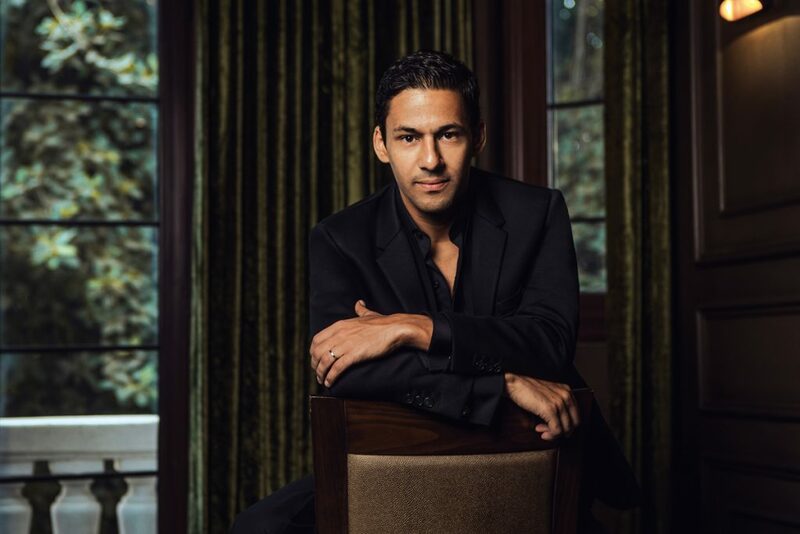 While Gamal studied law at university, he always had his eyes set on the big screen. Despite his family connections, he started out as an extra on TV. “I am not ashamed of it because it is something that has taught me a lot,” he explains. He recalls that on one day he grew so tired from the long hours, he just got a chair and slept in front of someone’s caravan. Now, however, he has his own trailer on set, which shows how far he’s come. 2018 has witnessed a number of his starring roles on hit TV shows like Al Ab El Rohy (The Godfather), El Khoroug (The Exit), and Kalabsh. Although Gamal’s grandfather, Farid Shawky, passed away when he was just eight years old; he vividly remembers him. “We were practically living in my grandfather’s villa in Agouza. The best days of my life were in that house,” he recalls. Now as an actor he is even more inspired by his grandfather and wishes to be like him and to take part in meaningful films with a message. “All the films that my grandfather did had important messages. I can’t spoil his legacy.” For Gamal, choosing meaningful projects is more important than just becoming famous. “Fame is easy. However, I want to create my own film history. Because at the end of the day acting for me is all about leaving a legacy behind,” he states. Currently Gamal is wrapping up filming for the second season of Al Ab El Rohy. My parents died suddenly, and I really would have liked to spend more time with them. I like to focus on the certain roles in a film. I loved Heath Ledhlger as The Joker in The Dark Night and Russell Crowe in A Beautiful Mind. My favourite Arabic film would have to be El Feel El Azra (The Blue Elephant). After God, of course Farid Shawky. Also Mahmoud Abdel Aziz. Asser Yassin, Maged El Kidwany and Khaled Saleh. A warm home, a house where I feel safe and hear the laughter of Sarah, my wife, and my son, Yehia. Understanding what responsibility is and being very independent. He’s only 22 years old, yet Hazem Ehab has already shared a screen with Yousra and is a regular cast member at Saturday Night Live – Bil Araby. But for this young actor, the road to success has been paved with many obstacles. He recalls, “At the beginning nobody supported me, especially not my family. They were perplexed by my choice and would tell me to just go study business and work in a bank.” People’s objections would shake his confidence from time to time, but he didn’t listen. “That’s something I am really proud of, that I didn’t listen to these voices,” he says. Growing up in Kuwait, it wasn’t until Ehab moved to Cairo for university at the tender age of 18 that he began pursuing acting full time. He recalls, “At the beginning I did an acting workshop with Khaled Galal; and I would pass by the casting agencies and introduce myself.” These run-of-the-mill open calls at casting agencies landed him a series of popular commercials, which led him to a reccurring role at Saturday Night Live – Bil Araby. Sadly, Ehab’s mother passed away three years ago when he was 19. Although he is still visibly hurt by that, he uses his grief to push him forward. “I am sure my mother is proud of me,” he says. Just last year, he landed a role opposite Yousra in the Ramadan TV show, El Hesab Yegma’a (The Cost Adds Up). “Yousra really made me feel safe on set,” he recalls. “I just really wish to be a successful person, and to have people believe in what I do,” he explains. He is currently working on a film with his SNL cast members. A kid with a dream. Is there an aspect of your personality that you would like to change? I am overprotective with people around me. Not going to an acting school, I really regret that. The classics. I love Frank Sinatra, Michael Bubble, and Ray Charles. Karim Abdel Aziz. I love the way he acts. I love how he is a dramatic actor, yet has a light comedic touch. Being happy is doing what you love whenever you want. When she’s a mother and a lover at the same time. One day I could be her man and in control of everything, and the other day I could go cry on her shoulder.